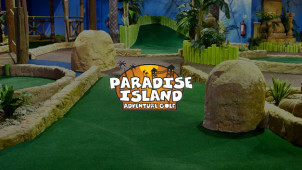 There are five fun Paradise Island Adventure Golf venues: Cheshire Oaks, Manchester, Glasgow, Livingston and Sheffield. Each one offers a fun and relaxed place where groups of friends, family members and colleagues can play a competitive round of adventure golf. Instead of teeing off in the pouring rain, you can take a leisurely approach to your game as you seek to win more points than your fellow competitors. Think of Paradise Island Adventure Golf as a step up from your usual Crazy Golf. It’s bigger, better, and a lot more fun – especially if you use your Paradise Island Adventure Golf offers to save some money. There are different courses to play at each Paradise Island Adventure Golf venue. For example, you can tee off at a ‘port’ and navigate your way through shipwrecks and rock pools, or explore a jungle and cannibal camp, ending your journey in the midst of a ruined temple. It’s all super fun, so get ready to enjoy the sights, sounds and smells of an exotic location! Looking for a venue to hold a party or corporate event? Look no further than the Paradise Island Adventure Golf closest to you. Paradise Island Adventure Golf specialises in parties, group events and corporate/hospitality entertainment. Because each venue is indoors, it won’t matter a bit if the weather is poor or it’s the middle of winter. Your guests will have a ball and if this is a corporate event, you will make a great impression on your clients. Make sure you sign up for the Golf Club. This is an exclusive membership club for Paradise Island Adventure Golf members. You will be sent regular e-shots containing news, exclusive member offers and special offers such as 2for1 deals. The one thing that won’t happen is that your details are sold on, so don’t worry! How do I use Paradise Island Golf vouchers? Visit the vouchercloud site to find out if there are any great deals and discounts for Paradise Island Adventure Golf. Click on the deal you are interested in and copy the discount code that appears on your screen. Visit the Paradise Island Adventure Golf website and select the tickets you need for your visit. Use your voucher code when you book and pay online for Paradise Island Adventure Golf entrance tickets. The Paradise Island Adventure Golf card is a great deal for members. After three visits to your nearest Paradise Island Adventure Golf course, you will qualify for 50% your next game. On your 5th visit, you qualify for a FREE GAME! You can pick up a loyalty card from any Paradise Island Adventure Golf venue. Can I buy a Paradise Island Adventure Golf gift card? A Paradise Island Adventure Golf gift card is a present with a difference and is perfect for anyone who loves to play golf. You can purchase Paradise Island Adventure Golf gift cards online or direct from any of the Paradise Island Adventure Golf venues. Are kids welcome at Paradise Island Golf? People of all ages are welcome at any of the Paradise Island Adventure Golf venues. Does Paradise Island Golf offer birthday parties? Yes, you can! Paradise Island Adventure Golf is a fantastic location for a kids’ party. Groups of children will thoroughly enjoy the tropical setting with tiki huts and palm trees. The team will take care of all party arrangements, including providing party bags, party invitations and party food. Different venues have different arrangements, so contact the venue closest to you for more details. You can get telephone numbers for each of their 5 venues here. Plenty of people enjoy a good game of golf, but it’s all a bit serious for a family day out. Go wild and embark on a crazy golf adventure, when you visit Paradise Island Adventure Golf. With jungle crazy golf courses in 6 venues nationwide, Paradise Island is a fun day out for all the family. Browse our selection of Paradise Island Golf vouchers to save on your round of the 18-hole course, and you could enjoy two games for the price of one! Beat the jungle and the competition, when you play Paradise Island Golf today. How Do I Use Paradise Island Adventure Golf Vouchers? From the popular Paradise Island golf in the Trafford Centre to the busy course at Cheshire Oaks, Paradise Island gold has 6 venues for you to choose from. Look out for special offers and vouchers to save at your nearest Paradise Island crazy golf course, and enjoy a cheap day out with kids. This is so much more than crazy golf! To avoid disappointment, we recommend booking ahead to take your family, friends or workmates on an epic adventure. Grab a Paradise Island golf offer to tee off for less, and save your money for post-adventure lunch, dinner or drinks.